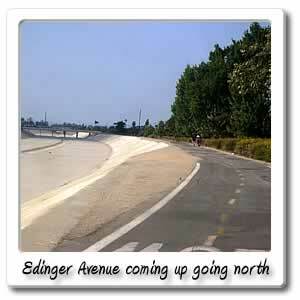 Welcome to Edinger Avenue on the Santa Ana River bicycle trail. 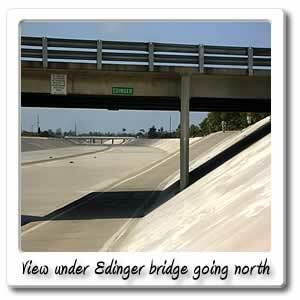 Just after the 7 mile marker, you'll be at the Edinger bridge. Half a mile west off of the bridge you can find a Subway, Lee's Sandwiches, Bank of America, and Taco Bell. Going another mile will take you to the Northeast section of Mile Square Park. 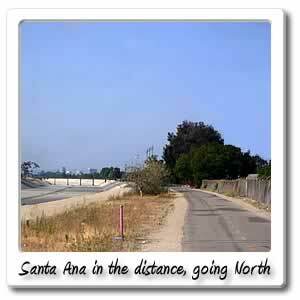 If you continue on another mile you'll reach the end of the north part of Mile Square Park, at this point you'll be at Brookhurst Street, at that intersection, will be an Albertson's, Pizza Hut, Starbucks, Walgreens and Wells Fargo Bank. 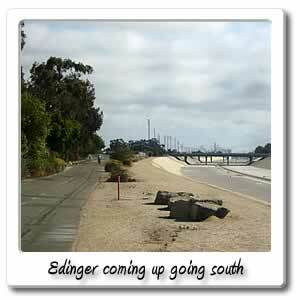 Immediately exiting Edinger and going east, will be Centennial Regional Park which has a playground, trails and a very nice lake. 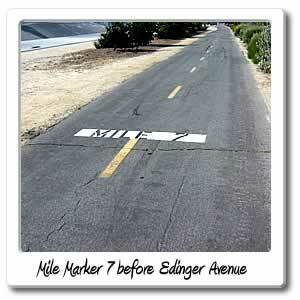 A little more than 1/2 mile east off of the bridge you will come to Fairview Street. There you can go to Shakey's Pizza on one side of the street. On another corner, is Subway. On the other corner, is a Taco Bell, and Stater Bros. market.